“Mississippi Innocence” Film to air on MPB on Thursday, May 3rd! “Mississippi Innocence” will screen at Millsaps College tomorrow, Tuesday, March 20th at 7pm. The film will be shown in the Ford Academic Complex room 215. Following the film, there will be a question and answer time with project director, Tucker Carrington. “I try to think of the horror of being sentenced to death when I am innocent, and I realize I cannot begin to imagine what these men have gone through. These stories about the realities of our justice system are compelling and fascinating. We are most fortunate to have Professor Carrington here for this event, and people will be glad that they came to see the movie and hear about the project,” said James Bowley, professor of religious studies. The event is sponsored by the Millsaps Secular Society, S.L.A.C.K.E.R.S., the Jewish Culture Organization and the Young Democrats. A Screening and Dialogue Around “Mississippi Innocence” hosted by the American Constitution Society in Washington, D.C.
On Wednesday, March 21, 2012, at 5:30 p.m., the American Constitution Society for Law and Policy (ACS) will host A Long Road to Innocence: A Screening and Dialogue Around Mississippi Innocence. Last month, a Mississippi district attorney secured a conviction for murders that were committed more than 20 years earlier. Many would suggest that justice, like an old adage offers, is better late than never. However, in this case, also more than 20 years ago, two men were deemed responsible for these murders; Levon Brooks was sentenced to life in prison and Kennedy Brewer was sentenced to death. The two men were exonerated and released from prison in 2008, having spent a combined 32 years incarcerated for crimes they did not commit. For Brooks, Brewer, and the victims, justice came very late, so is this even justice at all? Mississippi Innocence explores this question and others as it tells the story of Brewer and Brooks. Have the close to 300 DNA exonerations since 1989 demonstrated the need for additional practices and policies that would prevent wrongful convictions? As eyewitness misidentification is the leading cause of wrongful convictions, did the Supreme Court just increase the likelihood of such convictions with its decision in Perry v. New Hampshire? Where are the checks on overzealous law enforcement and prosecutors, faulty forensic science, false confessions, and informants that also lead to wrongful convictions? Importantly, how can our criminal justice system chart a path forward that guarantees accountability and basic fundamental fairness for all? “Mississippi Innocence” has been accepted into the Cinema on the Bayou Film Festival. This festival is focused on presenting nationally and internationally acclaimed humanities themed documentaries and filmmakers with truly original voices. Cinema on the Bayou will also showcase new, cutting edge, fiction and non-fiction films from around the world in a relaxing environment, laced and embellished with Cajun culture’s unique identity markers, exquisite cuisine and great music. The 2012 Film Festival will be held January 25-28, 2012, in Lafayette, Louisiana. “Mississippi Innocence” will screen at 12:30 PM Saturday, January 28, 2012, at the Acadiana Center for the Arts (AcA). More information, including schedules and tickets, may be found at the Festival’s website: http://www.cinemaonthebayou.com/index.cfm. Tuesday, October 25, 5:30 p.m.
“Mississippi Innocence,” the award-winning documentary that traces the combined thirty year ordeal of Levon Brooks and Kennedy Brewer, two Mississippi men convicted of crimes that they did not commit, will screen at The Lyric Theater at 7 p.m. in Harrison, Ark. Sept. 9 as part of the Ozark Art Council fall arts series. 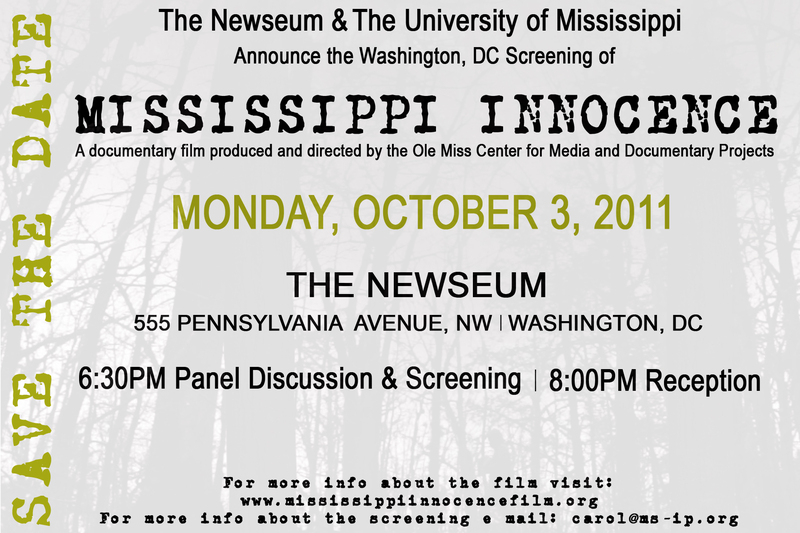 The University of Mississippi Media and Documentary Projects and the Mississippi Innocence Project announce the screening of their documentary film Mississippi Innocence, at The Newseum in Washington, D.C., October 3, 2011. The screening will take place at The Newseum’s Annenberg Theater. Prior to the screening there will be a panel discussion moderated by Dahlia Lithwick of Slate Magazine — and including Judge Harry Edwards, American University’s Washington College of Law Professor Angela Davis, Producers: Joe York and Tucker Carrington, and others. The University of Mississippi is hosting a reception in The Newseum foyer after. This is a free event, however there are limited tickets. Please email carol@ms-ip.org if you are interested in attending. SCREENING OF MISSISSIPPI INNOCENCE TONIGHT! Mississippi Innocence will screen tonight at the Crossroads Film Festival at the Malco Grandview in Madison, Mississippi. The screening is at 6:50pm and tickets are available at the box office. Please click here for directions. Special Guest, Levon Brooks, filmaker, Joe York, and Producers Tucker Carrington and Andy Harper will all be at the screening for a Q & A following the film. Below is The Clarion-Ledger review of the film. Skeptical that wrongful convictions ever take place? Then watch Mississippi Innocence. John GrishamThe documentary can be seen at 6:50 p.m. today (Friday, April 1) at the Crossroads Film Festival at the Malco Grandview in Madison, Miss. John Grisham recently gave his opinion on the case.